These days it feels like if you've seen one mechanical keyboard, then you've seen them all. The ones aimed at gamers are often gaudy with funky designs and now-requisite RGB lighting. Not all of them are that way, but for every well designed keyboard there might be two or three that look like someone upchucked a rainbow. That's why we're cautiously excited about the Wooting One. You might have heard about the Wooting One already. For those of you who haven't, it's an analog mechanical keyboard that was successfully funded on Kickstarter and now available to pre-order. The Wooting One has adjustable RGB backlighting, but that's not what makes it unique. It's the analog input that's of interest here. This is basically a variable input keyboard that knows how much pressure you're applying to keys, which can offer more precise movement in games. Take a driving simulation, for example. Instead of making a hard left turn, maybe you need to turn the steering just a smidgen. A light press of the "A" or "D" key will do that, while pressing down harder will turn the wheel even more. Like an analog gamepad, the Wooting One gives you greater control over movement. Press lightly to walk, harder to run, and so forth. They keyboard uses new Flaretech optical switches. The Flaretech Red switches are linear and silent, while the Blues are non-linear and clicky. They're also swappable—not just the keycaps, but the actual switches. When you're not gaming, you can switch over to digital mode and pound on the keys just like any other mechanical plank. One of the caveats is that not all games are supported yet. Analog movement is only supported in games that support either gamepad and/or Xinput (Xbox controller). Where things get tricky is that some game developers who have implemented Xinput also decided to turn off the keyboard and mouse when Xinput is detected, and vice versa. So, some games won't work properly. If this thing takes off, however, those kinds of issues will sort themselves out. 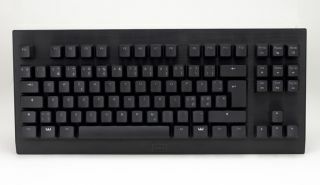 The other caveat is that the Wooting One team has run into issues getting this keyboard mass produced and shipped. There have been kinks with the switches and even the plank itself. In its latest blog post dated January 9, 2017, the company said it's working on those issues and hopes to start delivering the keyboard to buyers in March or April. If you're interested, you can pre-order a Wooting One starting at $180 (€160).